Sunday is an election day in many countries. 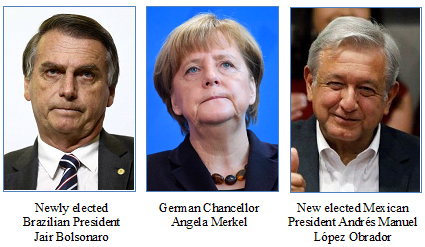 Last Sunday, Brazilian voters elected a new president, Jair Bolsonaro, called the Donald Trump of the South. In Hesse state, home of Frankfurt, the German financial capital, voters continued to turn away from Angela Merkel, the European anti-Trump, and her ruling center parties and rewarded more left and right parties. Both elections reflect a trend of voters looking for alternatives to the status quo, empowering parties and personalities recently seen as fringe and promising to disrupt the establishment. Bolsonaro, whose campaign focused on corruption and crime, joins nationalist in Western Europe now ruling in Italy, Hungary and Poland. He’s on the right, but is similar to Mexico’s newly elected president, Andrés Manuel López Obrador, who is on the political left, but was elected as a similar anti-establishment disrupter attacking corruption and promising more security. Merkel’s political power is gone and her term will end as soon as her coalition can find an alternative that can help them win an election. But, the likely winners in the next German election will be a mélange of parties making assembling a government even harder than it has been for Merkel the last year. The Denver metropolitan area continues to be a leading region in the country that’s willing to invest in its future. John Wenzel, a Denver Post survivor, chronicles the success of the region’s cultural scene most recently with a front page story titled, “Artful Outlook: Denver’s reputation is on the rise as a must-see for cultural events.” As he describes, Denver’s major cultural venues have become favorite stops for the best of Broadway and the nation’s top art, historic and scientific exhibits. From the Denver Center for the Performing Arts’ hit “Hamilton,” to the Denver Museum of Nature and Science’s Dead Sea Scrolls, to the Denver Art Museum’s recent Van Gogh exhibit and hugely popular “Star Wars” costumes exhibit (I went twice), to the Denver Botanic Gardens’ crowd-attracting Chihuly sculptures, the area’s high quality cultural scene has added “Culture Town” to its already well-known reputation as a “Cow” and “Sports” town. Wenzel points out that the Denver region’s civic leaders and voters generously support its cultural life. He cites the Scientific and Cultural Facilities District (SCFD) as a national model in regional cooperation, which has undergirded the cultural scene for 30 years with public funding for operations and public access. 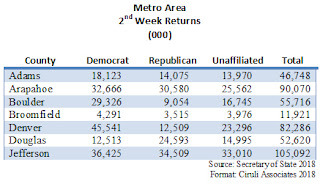 But, regional voters have also built sports stadiums and, recently, Denver voters approved fees and taxes for a massive rebuild of the Stock Show complex. One factor of the region’s success is its display of a temperament in short supply in the country today. A broad group of civic leaders has been willing to look beyond parochialism, make compromises in crafting proposals and then unify behind a common strategy. 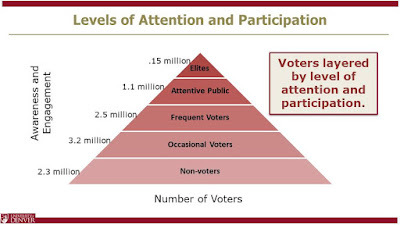 By staying focused on the public benefits, voters have joined them and approved. The Republican D.C. consultants pulled millions of dollars of TV advertising out of Mike Coffman’s race seat and gave it to Maria Elvira Salazar in Miami. Salazar is a broadcast reporter/anchor for Telemundo and Univision. 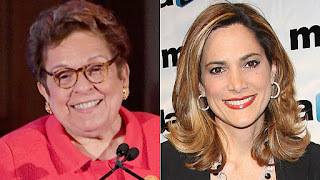 She is attempting to hold a long-time Republican district that has been trending Democrat from Donna Shalala, the former Clinton cabinet member and former president of the University of Miami. 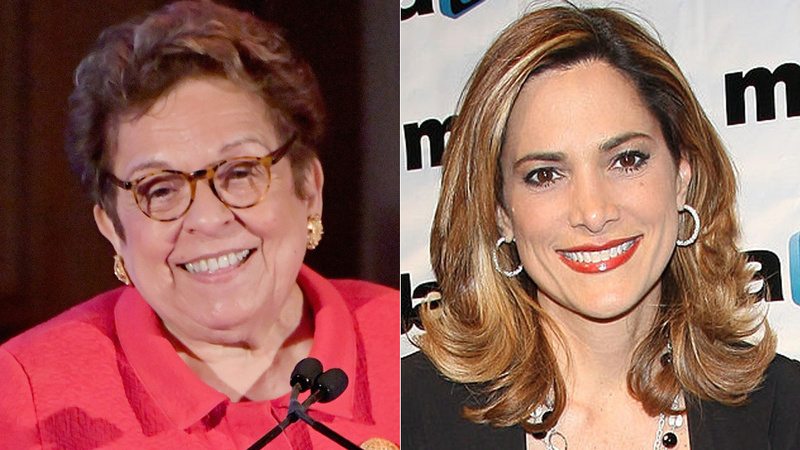 Polls have Shalala up by about 5 points. Florida’s District 27 was represented by Ileana Ros-Lehtinen, a fierce anti-Castro Cuban, for 30 years. Obama and Clinton carried the district in 2012 and 2016, respectively. campaign for a Republican challenger in Miami. 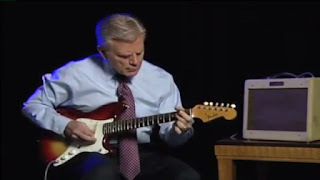 Both the leadership PAC of Speaker Paul Ryan and the official National Republican Congressional Committee (NRCC) have withdrawn millions in TV ads from the race as “beyond reach” (see blog: Mike Coffman Coffman: Out of Reach?). The latest New York Times/Siena College poll, which shows Coffman losing by 9 points, highlights what’s different this time from Coffman’s previous tough re-elections. Coffman has not had to deal with two years of Donald Trump. Nationally, Trump is 8 points under water. In Colorado’s 6th District, he’s 22 points down. The generic ballot test is 8 points toward Democrats nationally, but 14 points negative for Republicans here according to the Times poll. Coffman, of course, tried to keep his distance from Trump and the Republican House leadership, but Trump’s nonstop blunderbuss simply takes all the space to politically maneuver. Reinforcing this, Democratic advertising in the 6th CD, and in most Colorado state races, ties Republican candidates to Trump as their main message. And, the issues Coffman’s and his Republican colleagues focused on the last two years were of no help. Repeal but not replace on health care, nothing on guns, not even a bump stock ban, and constant dithering on DACA and funding the wall gave Coffman a record to run from, not with in 2018. Knowing that Colorado’s 6th CD could help put Nancy Pelosi back in the Speaker’s Chair, Democrats recruited a strong candidate in Jason Crow, and then loaded him with millions in financing. Even before the latest loss of funding, Crow had a $2 million advantage over Coffman with out-of-state money, which by the second week of October was a record $19.8 million in reported expenditures. Coffman continues to run an aggressive campaign, and just received the Denver Post’s endorsement, which he has regularly won, but it appears this seat is going to contribute to the Democrats’ run for control of the House. If Coffman loses, the 6th CD will be a clear example that Donald J. Trump is a liability and not an asset for Republicans in many swing districts. The proposal to ban slavery is back on the ballot. In a KOA interview (Oct. 22) with April Zesbaugh and Marty Lenz, we discussed what happened to the proposal in 2016, the last time it appeared, and the difference this year as a part of KOA’s ongoing 2018 election coverage. The proposal revises the 19th century language in the Colorado State Constitution that says slavery and involuntary servitude are banned except as punishment for a crime by removing the exception language. Changes will not affect prison work or community service programs. In 2016, the proposal lost by 16,000 votes in an election with 2.2 million voters. Advocates believe it lost partially because it was near the end of the Blue Book and the ballot – Amendment T, now it’s toward the beginning – Amendment A. More than 250,000 people who voted did not vote on Amendment T.
Most importantly, they believe the ballot language in 2016 was confusing. It described the purpose of the amendment as “concerning the removal of the exception to the prohibition of slavery.” This time it very clearly says: “there shall never be in this state either slavery or involuntary servitude” and then strikes the “except as a punishment for crime” with lines clearly marked through the removed language. Amendment A was referred unanimously by the Legislature, and as yet, has no registered opposition. There will still be some no votes from people who don’t like to change the Constitution or care for the symbolism of the change. So, we shall see the level of the no vote, but it’s assumed in 2018, Amendment A banning slavery will pass. 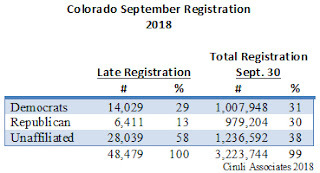 Midterm elections attract fewer voters than presidential elections, but with polls showing interest and enthusiasm up, and Colorado’s recent increase in registration, more than 2.5 million Coloradans may return their ballots by November 6. In the 2014 midterm, which saw Democrats win a handful of House seats nationally but lose control of the U.S. Senate, Colorado had slightly more than 2 million voters participate. Statewide voters split their tickets, reelecting Democrat John Hickenlooper as governor by 68,000, but exchanging incumbent U.S. Senator Mark Udall for Republican Cory Gardner by 40,000 votes. There are 3.2 million voters registered, 348,000 more since the 2014 midterm. If about a similar 71 percent turnout, 2.3 million voters will cast ballots. If the enthusiasm that has been registered in some polls is correct, the vote could reach 2.5 million. 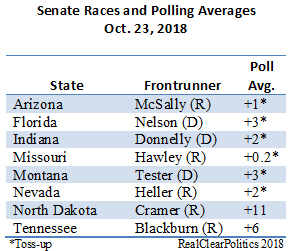 The Denver Post reported on October 12 that Republican Congressman Scott Tipton is in a “toss-up” race according to FiveThirtyEight, Nate Silver’s political rating website. Silver must see a massive blue wave that is going to help Democrat Diane Mitsch Bush. 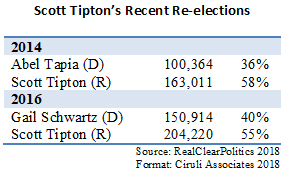 No polls have been published, and Tipton’s re-election track record is impressive. Tipton has won against well-funded opponents by 15 percentage points or more. In 2016, while Donald Trump was winning the district by 196,000 votes, Tipton won by 204,000. The extra 8,000 voters were mostly in Pueblo County, which Trump won by 600 votes and Tipton carried by 9,000. 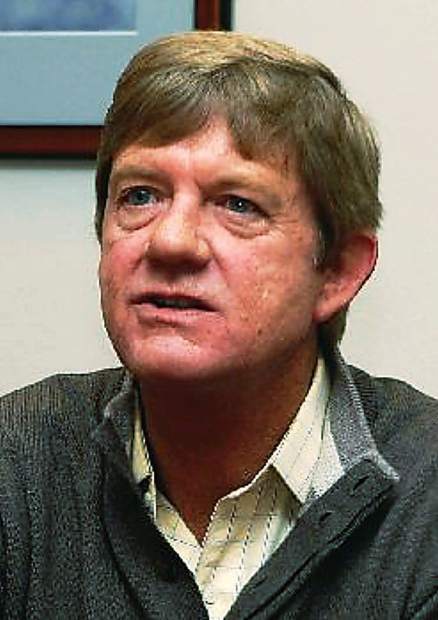 He won his Western Slope base, Mesa County, by 66 percent. I told Anna Staver, the Denver Post reporter, that I appreciated her story, but short of an extraordinary event, a PhD in sociology from Steamboat Springs, was going to be a hard sell in many parts of the district, but especially Pueblo. The Denver Press Club’s Hall of Fame awards and dinner is becoming Denver’s version of the White House Correspondents Dinner. A crowd of several hundred mingled with the region’s top media talent, managers and owners. 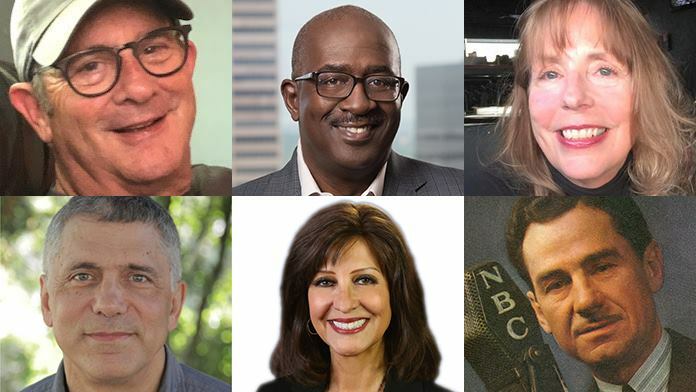 This year’s honorees were all stars of the metro Denver’s legacy media. The Press Club in recent years has managed to attract television and radio to its historic focus on the print media. The expanded participation is a product of the new president, David Milstead (about to leave for a newspaper position in Toronto), his officers, and former Channel 4 and 9 president, Roger Ogden. 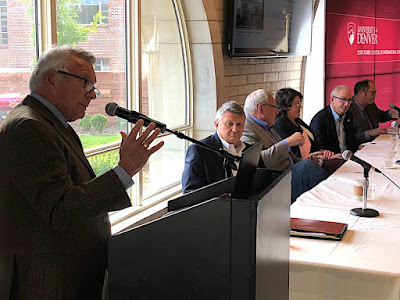 Jerry Bell – managing editor and voice of KOA, the region’s most powerful talk and sports radio, with station manager Kathy Walker and a contingent of iHeartMedia’s top local management in attendance. 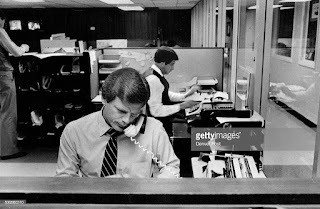 Greg Moore, now at CU, recently completed 14 years editing the Denver Post, from the War in Iraq, to the great recession, through Colorado’s recovery and reputation as a political swing state. (He managed to leave just before Donald Trump became the nominee.) The Post was well represented with current and former employees. 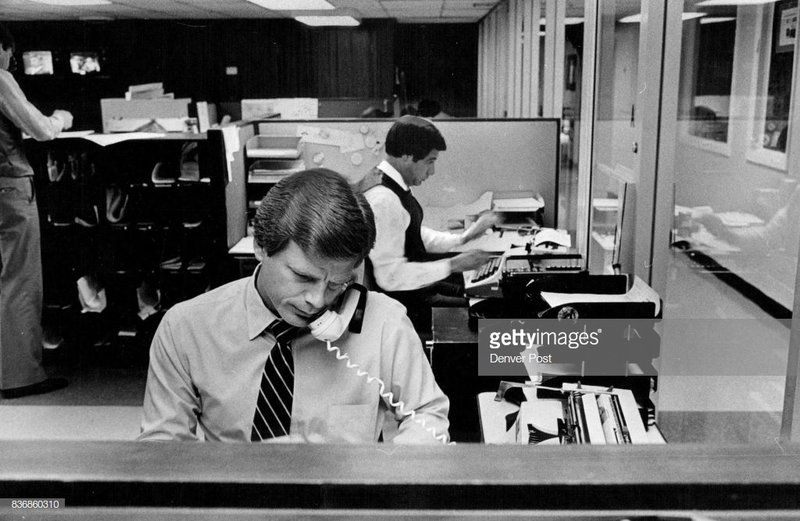 John Temple, final editor publisher, and Janet Reeves, photo editor, were key actors in the late Rocky Mountain News – the paper many in Denver still mourn after its demise in 2009. Its loss marked the beginning of the long slide of print news in Denver, with the diminished Post holding on. Anne Trujillo of Denver 7 has a 30-year plus, Emmy winning career in TV journalism. Lowell Thomas, one of the nation’s earliest and best known radio and TV personalities, was honored. His career spanned 40 years, started in Victor, Colorado, and included a DU degree. Competitors and partners of legacy media, mostly online, were also well-represented, including the Colorado Independent, Colorado Sun and Colorado Politics. Changes to the process of redistricting are very important to the politics of the state. It will influence which party controls the legislature, and in 2022, it could decide which party has the best chance to win Colorado’s new 8th Congressional District. America has been concerned about the fairness of redistricting since its founding. Gerrymandering has been and still is controversial. In Colorado, out of the current seven congressional districts, only one appears competitive – the 6th CD of Mike Coffman – in the metro area. All the rest, Democrats DeGette, Polis and Perlmutter or Republicans Buck, Lamborn and Tipton have not been closely challenged in elections for most of their careers. In the State Legislature, only 4 or 5 districts in the 35-person State Senate are considered competitive. The main goal of the measures is to reduce partisanship in the drawing of new maps after the census and add competition between the parties as one of the criteria the new commissioners should consider. The two measures were put on the ballot by the leadership of both parties and the members of both houses. 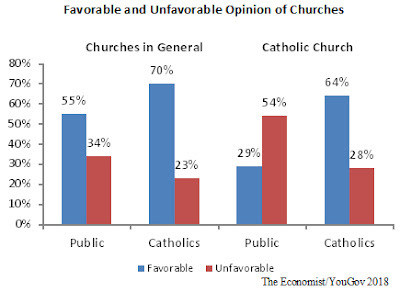 The major interest groups that advocate reform are on board and there doesn’t appear to be engaged opposition. The proposals are complex, taking 22 pages of the War and Peace length, 65-page Blue Book. The three main goals are to reduce the partisanship among map drawers by allowing retired judges to pick people from applicants, with some people put on the panel by random draw. A non-partisan staff is supposed to assist. Rules to increase transparency with open records, open meetings and lobbyists having to register were added. Finally, after the normal criteria for drawing districts, such as equal population and voting rights, be as compact as reasonable, and preserve communities of interest (cities, communities, etc.) where possible, they will attempt to maximize competitive districts. The whole effort ends with a Supreme Court review for possible “abuse of discretion” in applying the criteria. Opponents complain the process is too complex, the criteria too vague and opaque, and it won’t really remove partisan preferences. These two reapportionment measures are likely to pass. As Richard Nixon faced his Watergate accusers after his landslide 1972 re-election, critics had already established an intellectual theme, the Imperial Presidency, that appeared in scholarly journals, books and guest editorials. It urged action to tame his administration’s behavior. After his resignation and pardon, the 1974 midterm elections brought 43 new Democrats to the House and three more to the Senate, setting the stage for new legislation to constrain the Nixon administration’s long described rogue behavior. The War Power Act was passed (before the resignation), along with dozens of laws related to elections and abuse of power, such as the Federal Elections Commission and Freedom of Information Act. To help strengthen congressional oversight, the Congressional Budget Office was created. The growth of presidential power was slowed. Similar to the 1970s, an entire publishing industry has been established critiquing President Trump’s abuse of power and danger to democracy. Google the term “Trump and fascism” or “authoritarianism” and see dozens of citations to popular and academic references. The intellectual framework is in place to limit the Authoritarian Presidency. If the Democrats win the House in the 2018 midterm, it will reflect a desire by voters to put some side rails on the Trump presidency. Discussions have already begun about which House committees would be involved, what issues addressed and the timing and process to follow. One of America’s most extraordinary cultural funding organizations, the Scientific and Cultural Facilities District (SCFD), is celebrating its 30-year history in an event on November 28 at the McNichols Civic Center. 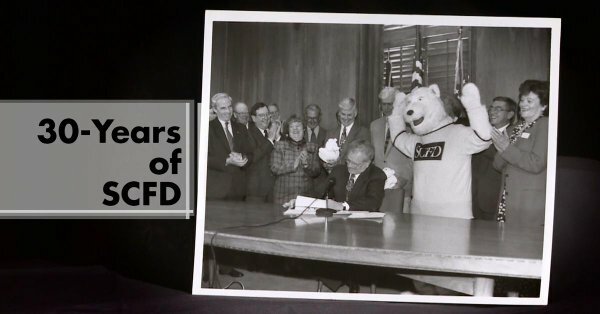 As part of the celebration, Rocky Mountain PBS has created a program highlighting the founding of the SCFD. 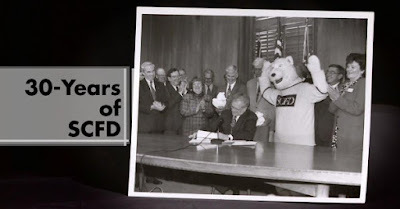 Governor Roy Romer signed the legislation creating the District on July 1, 1987, with supporters gathered around his desk. In November 1988, 75 percent of Denver metro voters in six counties authorized the collection of the sales tax, producing about $14 million for distribution to regional cultural organizations starting in 1989. Today, more than $60 million will be distributed. Ciruli Associates was the primary consultant for the creation of the SCFD. It managed the initial campaign in 1988 and the subsequent renewals in 1994, 2004 and 2016. Thanks to RMPBS, the SCFD and the Citizens for Arts to Zoo (CATZ) (a civic organization that supports the SCFD) for their support of the 30-year celebration. Ciruli Associates provided the historical material for the RMPBS program. 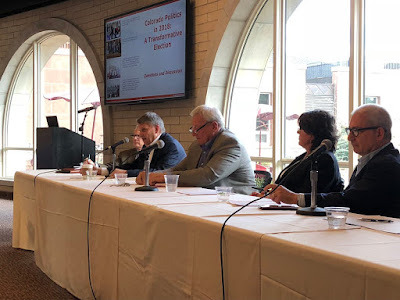 A panel of political experts assembled by the Crossley Center for Public Opinion Research at the University of Denver’s Korbel School reviewed the range of state and national political topics in the 2018 midterm election. Floyd Ciruli, director of the Crossley Center, moderated the two-hour discussion on candidates and issues. He said polls and the decisions by both national parties to withdraw money from the 6th Congressional District race suggest Coffman, the five-term incumbent, also might be in deep trouble as a blue wave gathers. As with Stapleton, national events could overtake his candidacy. He said the race would have little directly to do with Coffman or his challenger, Democrat Jason Crow, and more to do with Trump and the energy on the left. 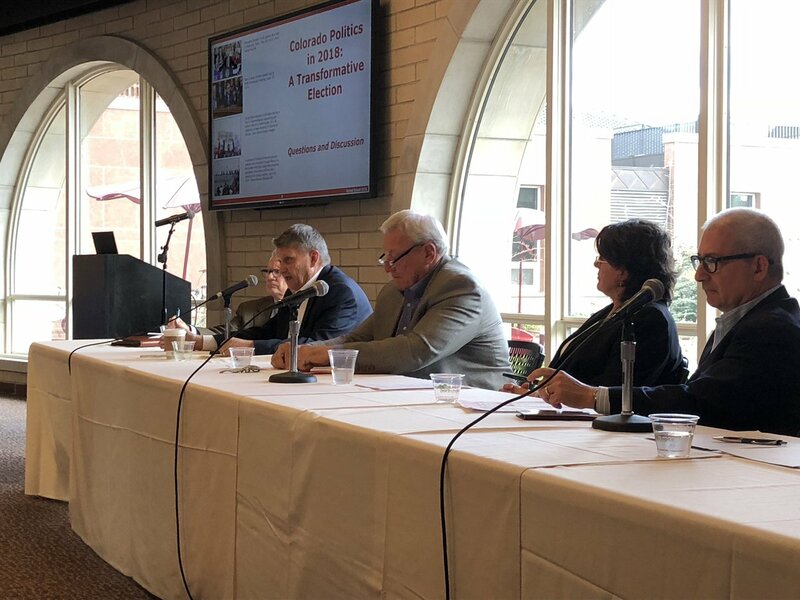 The panel convened by the Crossley Center for Public Opinion Research at DU agreed that Stapleton and U.S. Rep. Mike Coffman, a usually popular incumbent from Aurora, are running in a tough environment for Republicans this year. Usually Republicans can separate themselves from the national party to appeal to local voters, but President Trump has kept the focus on him, making this midterm a referendum on his politics and antics. Six televised gubernatorial debates are scheduled over the next four weeks beginning this Friday. A new poll shows Republican Walker Stapleton is behind by 7 points, which is about where the race was at the primary in late June. Stapleton must change the dynamics of the race to have any chance to win. Voting will begin on October 15 as ballots are mailed to 3.2 million registered voters. These were among a number of observations offered during the Marty Lenz and Ed Greene interview. 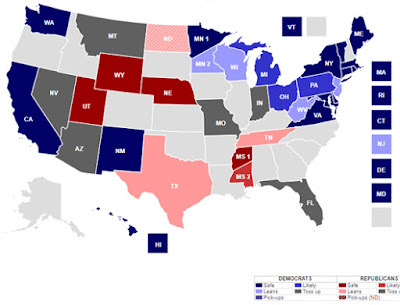 Is Colorado Now Blue? A Panel of Political Experts Predict. 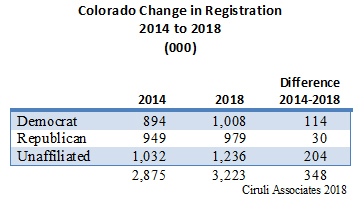 Has Colorado shifted from its swing state status of a more reliably Democratic state? The last three presidential elections, new registration figures and 2018 primary turnout has trended Democratic. But Colorado voters still split their tickets. Voting starts in mid-October. 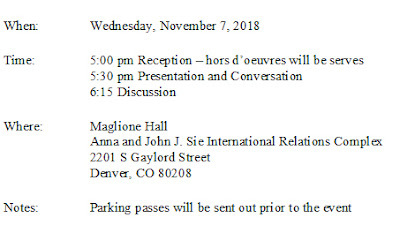 Join a panel of the state’s political experts who will discuss the Colorado and national political environment just before voting starts. Along with the national election, they will discuss the Colorado governor’s election and partisan change in the balance in the state legislature, as well as significant ballot issues on fracking, school and transportation funding.